Sports bike, tourer, everyday commuter or track day surprise, this is the Fazer 1000! Here we have an R1 in disguise, a 'Q' bike or a wolf in sheeps clothing; it's a bike that can do everything and anything you throw at it and it just keeps coming back for more.. 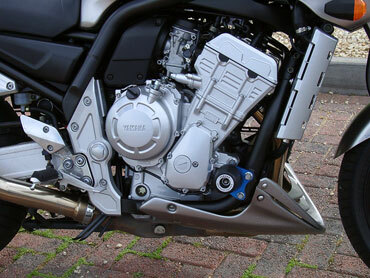 The Fazer powerplant is aesthetically the same motor as the R1 (old version of course!) and puts out a respectable 143PS at 10,000rpm instead of the 150 of the sports bike. But where the Fazer differs is in the torque output, with 10.8kg-m of torque at 7500rpm which is about the same as the R1 but at whole 1000rpm less. It also weighs in at 208kg making it a little bit on the heavy side by some other bike comparisons, but that isn't a factor when you ride it. So a stripped down R1 eh? Well no not really. It won't keep up the pace on the same stretch of twisty road as an R1, but that really isn't what this bike is all about. The Fazer 1000 is a truly sensible bike which makes perfect sense, it's no slug on any road, yet it's not a loony sports bike! 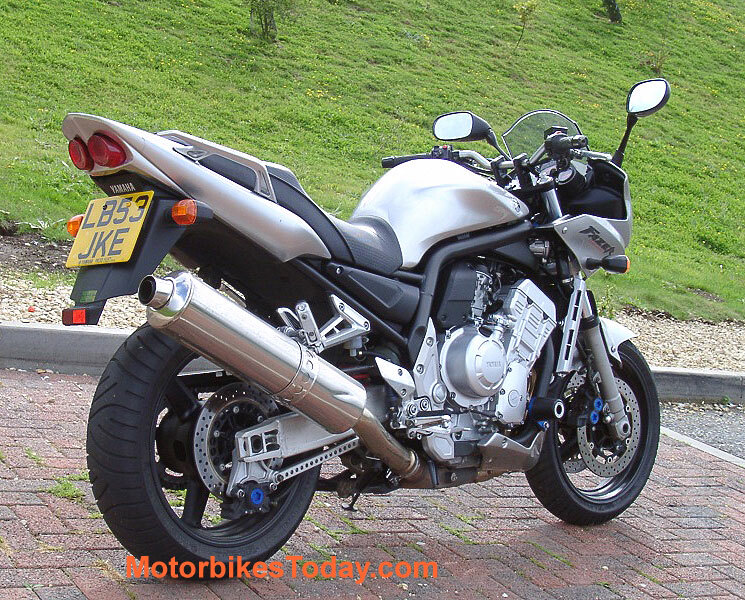 The Fazer 1000 is, and has been, designed to be a muscle bike from the outset and scores top marks here. There's torque by the bucket-full from the bottom end and this makes high gear riding very easy. It's fast by anyone's standards and super comfortable with it. Also there's stable handling and pretty good protection from the top fairing. All this adds up to a bike that can be used day in, day out in any conditions. 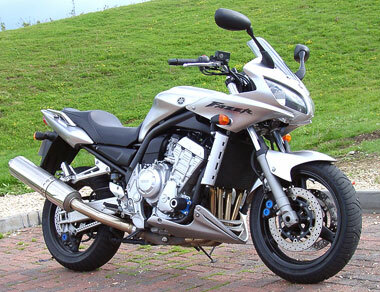 If you look at the Fazer motor you will immediately see it's an R1 lump, but that's where things change for the FZ1000. Smaller 37mm carbs feed the engine now instead of the old R1's 40mm ones, a heavier crank and a lower compression ratio for smoothness and an alloy head instead of a Magnesium one. All this adds up to better bottom end power and a super smooth delivery all the way through the rev range. Take a look at the frame of the R1 and then look at the Fazer. Gone is the alloy beam frame, what we have here is a tubular steel chassis. This frame houses the motor on link style rubber mountings making the combination even more smooth and vibration free. Add the new style alloy swingarm and the conventional 43mm front forks to the equation and you get a refined bike which is still right up there in the realms of good handling. The front forks have dual rate springs and are fully adjustable, the rear shock gets pre-load, rebound and compression adjustments. First impressions when you get on the bike are of comfort and a relaxed riding position, the bars are reasonably high and wide and the seat is low which gives you a feeling of sitting in the bike rather than on it. No uncomfortable twists or bends, no prising you off it at the other end of the trip; this is a bike you can ride a long way on and be utterly comfortable all the way. The seat height may be a bit higher than usual but Yamaha do a lower seat option which may well be worthwhile for some. Instruments are standard analogue set-up and are easy to both read and use. Looking behind you will take a bit of getting used to as the mirrors are set pretty high and wide on long arms, great for filtering as they will clear most car mirrors by miles! Out on the road the Fazer 1000 feels almost nimble and silent, there's no crunching from the gearchange, not much engine noise and no raspy bark from the exhaust. Yamaha have made changes to the gearbox on the FZ1000; there is a new gear linkage which seems to aid in smooth changes and a different lightweight clutch to feed the power to the rear wheel via a slightly higher ratio sprocket than the R1. Power on and accelerate and you will see just what I mean, creamy smooth and feeling pretty docile up to about 8,000rpm, then the R1's trait starts to show a bit as the Fazer rockets forward at an alarming rate all the way to the redline! It's a powerful bike and like most litre class sportsbikes will point at the sky if you wind it on hard in the lower gears. Of course you don't have to ride it like that all the time, the Fazer is perfectly at home riding in the neutral zone up to 8,000rpm using the torque and power in the mid range to quietly and efficiently whisk you along wherever you want to go! Riding on open roads the Fazer is a dream, long sweeping corners can be taken without fuss and bother and the long travel suspension soaks up most of the bumps on the other roads. I usually ride a similar route with all the bikes I test, so when taking the FZ1000 down my personal favourite stretch of 'B' road and encountering the usual bumps and ridges I was pleasantly surprised at the way the Fazer reacted, or didn't as I meant to say! On many occasions and on many bikes I have had to make a point of avoiding certain ridges or bumps, not so on the Fazer. It was totally composed and did not react to any type of undulating or bumpy surface. 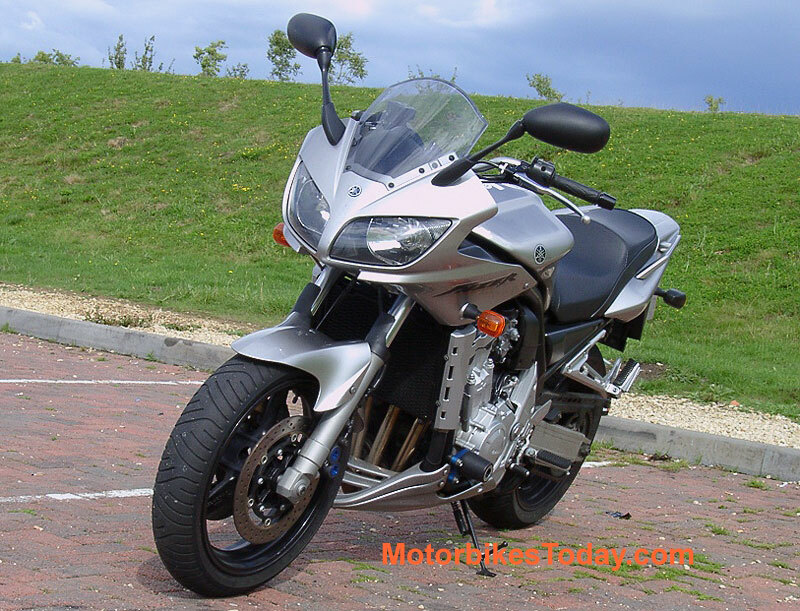 The FZ1000 was completely smooth and unfazed!! Braking is also up on a par with most sportsbikes as the FZ1000 keeps the renowned R1 front discs and calipers so stopping the somewhat weighty Fazer is no problem at all. Under hard braking you get full feel and control, there's no squirming on rough or bumpy surfaces as the suspension is still soaking it all up and nowhere near bottoming out, all in all you get the feeling of quiet confidence in any situation. The Fazer 1000 is no lightweight by todays standards, at 208kg dry it is some 30 + kg heavier than it's sportsbike counterparts but that doesn't mean you feel it though. With those wide bars and low seat and its sheer brilliant handling you just don't feel how heavy it really is. Corners and real road riding is what this bike is all about, with lots of torque and power, and this style of this bike if Yamaha had make it any lighter or as flimsy as a sportsbike it really would have defeated the object.